Invasive pests are a threat to trees, shrubs, landscapes and crops in every region of the U.S. Left unchecked, they can devastate entire plant species, threatening food supplies and costing billions of dollars in damages. In addition, they’re a nuisance for homeowners trying to enjoy their lawns and landscapes. These invasive insects easily can be transported from place to place on vehicles and can be hidden in fruit, vegetables, plants, firewood or on outdoor items, so it’s important for contractors to be able to properly identify them and know how to get them under control. Below are the top five invasive pests of concern to landscape and lawn care professionals, as identified by the U.S. Department of Agriculture. Read on for information about where they’re prevalent the plants at risk and some control methods. Always check with local experts and read and follow label instructions before using pesticides. The Asian longhorned beetle, or ALB, is an invasive insect that feeds on a wide variety of trees in the U.S., eventually killing them. The beetle is native to China and the Korean peninsula and is in the wood-boring beetle family Cerambycidae. Adult beetles are large, distinctive-looking insects measuring 1 to 1.5 inches long with long antennae. Their bodies are black with small white spots, and their antennae are banded in black and white. Places with federal quarantine: Massachusetts, New York and Ohio. What’s at risk: Hardwood trees, including ash, birch, elm, horse chestnut/buckeye, golden raintree, London planetree/sycamore, katsura, maples (including boxelder, red, silver and sugar maple), mimosa, mountain ash, poplar and willow. Control methods: Imidacloprid applied in the spring, early summer or fall—prior to adult emergence or when adults are feeding and laying eggs. All infested trees should be removed, even if they’ve been treated with insecticide. The European gypsy moth, or EGM, is native to Europe and first arrived in the U.S. in 1869. The caterpillars defoliate trees, leaving them vulnerable to diseases and other pests, and can eventually kill the tree. 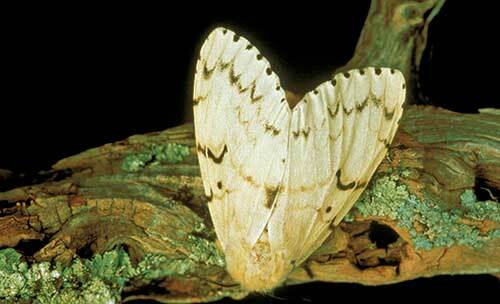 Adult male gypsy moths are light brown with dark brown wings, which have a series of black bands down their lengths. Adult females are slightly larger than males and are mostly white, also with a few dark bands on the wings. Gypsy moths are 15 to 35 mm long on average. Newly hatched larvae are black, hairy caterpillars, and as they age, they grow two rows of blue, then red, spots on their backs. Each spot has a patch of yellow or brown hair growing out of it. Legs of larvae are dark red. Places with federal quarantine: 19 states and the District of Columbia. What’s at risk: More than 300 species of trees and shrubs including aspen, birch, cedar, cottonwood, fruit trees, larch, oak, poplar and willow. Control methods: Chemical insecticides, such as acephate, carbaryl and others; mass trapping by setting numerous traps in an infested area to lure male moths and eliminate them from the breeding population; or mating disruption by saturating the treatment area with enough pheromone sources to confuse the male moths, preventing them from finding and mating with female moths. 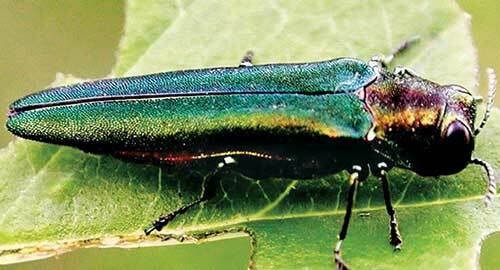 The emerald ash borer, or EAB, is an invasive wood-boring beetle. Native to Asia, the beetle’s first North American populations were confirmed in the summer of 2002 in southeast Michigan and in Windsor, Ontario. Adult beetles are typically bright metallic green and about 8.5 mm long and 1.6 mm wide. Underneath the elytra, the upper side of the abdomen is coppery-red, a distinctive feature of the species. Places with federal quarantine: 30 states. What’s at risk: All 16 species of ash trees as well as the white fringetree. Control methods: Acephate, bifenthrin, imidacloprid, imidacloprid + clothianidin, dinotefuan and others. Impacted trees should be felled and disposed of. The red imported fire ant, or RIFA, is among the world’s most infamous, aggressive and widespread invasive ant species. Native to South America, imported fire ants will feed on the buds and fruits of numerous crop plants, especially corn, soybean, okra and citrus. They can also girdle young trees. 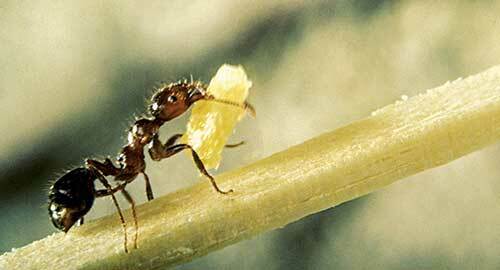 Fire ants measure 1/8 to 1/4 inch long. Red imported fire ants have a reddish colored head and thorax, as well as elbowed antennae. Places with federal quarantine: Most of the southeastern U.S., California, New Mexico and Puerto Rico. What’s at risk: Corn, soybean, okra, citrus, humans, young and newborn animals and agricultural equipment. Control methods: Abamectin, bifenthrin, chlorpyrifos, diazinon, fenoxycarb, fipronil, hydramethylnon, metaflumizone, methoprene, pyriproxyfen, tefluthrin and others. 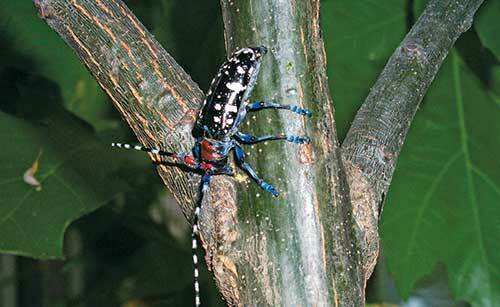 The spotted lanternfly is native to China and was first detected in Pennsylvania in September 2014. Spotted lanternflies feed on a wide range of fruit, ornamental and woody trees, with the tree of heaven being a preferred host. 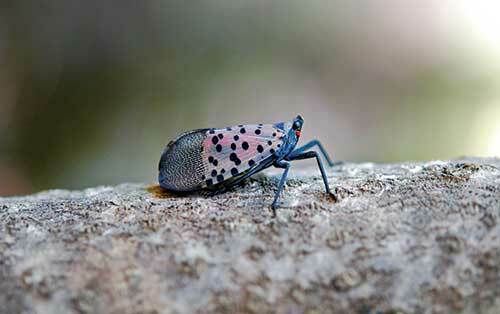 Adult spotted lanternflies are approximately 1 inch long and 1.5 inches wide and have large, visually striking wings. Their forewings are light brown with black spots at the front and a speckled band at the rear. Their hind wings are scarlet with black spots at the front and white and black bars at the rear. Their abdomen is yellow with black bars. Nymphs in their early stages of development appear black with white spots and turn to a red phase before becoming adults. Egg masses are yellowish-brown in color and covered with a gray, waxy coating prior to hatching. Places with federal quarantine: None. What’s at risk: Grapes, orchard fruits, hops and trees. Control methods: From September to June, egg masses on trees or other hard surfaces can be scraped off using a plastic card or putty knife. Scrape them into a bag or container filled with isopropyl alcohol or hand sanitize. Tree banding is another method. When the nymphs first hatch, they will walk up the trees to feed on the softer new plant growth. Wrap tree trunks in sticky tape to trap the nymphs. Chemical controls include acetamiprid, azadirachtin, bifenthrin, carbaryl, dinotefuran, imidacloprid, thiamethoxam, insect-killing/insecticidal soaps and more.